Ever since Henry Ford invented the first assembly machine prototype, the auto industry has never been the same. Originally created to carry out exact welding tasks that people were no longer interested in or capable of doing, assembly machines or manufacturing robots have been reinvented by the car industry to perform dangerous tasks like holding hazardous materials, precisely installing small automotive parts and welding heavy metals together. As time went one, not only did assembly machines help keep certain workers safe, but they also completed specific tasks more effectively and efficiently than humans could. 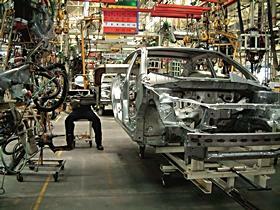 In fact, assembly machines now account for over 50% of all vehicle manufacturing. Similar to a computer, the magnificent robots that currently build todays car population are specifically programmed to perform a wide range of different manufacturing tasks. By being remotely computer operated, assembly machines are now able to eliminate the possibility of minute human error while they achieve accurate geometrical instructions at an exact chosen point in time. Whether the programming is designed to tell the assembly machine how materials should be turned, installed, or welded together, each individual robot proves to be quicker and more time proficient than a human operator. Another enormous benefit of using car manufacturing assembly machines is the actuality of their work environment capabilities. Made from certain, specific sediments and metals as well as lack of human characteristics, these amazing robotic machines are able to work in virtually all types of atmospheres. With all of this in mind, it is important to remember that assembly machines do not think for themselves. They cannot be operated without human control and supervision. In fact, assembly machines can still only assist people in their jobs rather than the other way around. Possessing specialized computer manipulation, the majority of all vehicle assembly machines have only one single arm that does not look like the stereotypical robot that is seen on television. On top of their one single operational arm, many robots will also have specific job related characteristics to help with optimal job performances. For example: the assembly machines that solely install car windshields will also be fully equipped with a high powered grip for suction that allows the handling of smooth, breakable glass. Interestingly, there are also various robots that have been created for the lone purpose of repairing each individual assembly machine. In today’s world of extreme manufacturing output, automotive assembly machines prove to be essential in the extremely detailed creation and production processes. While these specific car-building robots still need professional input, as assembly machines become more automated, their human dependence will continually decrease over time. Somewhat taken for granted, these incredible machines have additionally provided a variety of different benefits to human workers which include cutting down the amount of job related injuries and, in some cases, even creating more jobs to operate various different assembly machines.